There’s been a GDS team diligently working away improving search on GOV.UK. They’ve asked us to relay some important general advice to Whitehall publishers. They’ve come across several apparent duplicate results while testing site search, which are confusing users. The way to deal with this is to delete the superfluous versions (cue: contact your managing editor). If there are slight differences between versions of the same publication (eg. an easy-read version or a flyer format) add them together on one page and explain the nuances there. 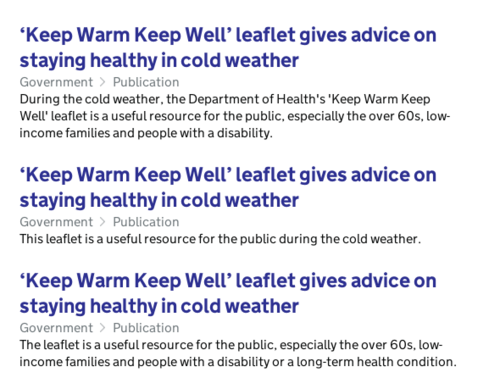 The big request here is to avoid duplicate or vague titles by writing them in the context of the whole GOV.UK site rather than the individual department. Better titles would expose the substantial content within documents - a quote, for example. Judicious use of metadata is also OK where it is going to help users differentiate search results. For example, another document related to the Woolwich incident published by the Home Office had the title ‘Home Secretary’s statement on Woolwich attack’, which is at least clearer and more distinct without having to read the description to tell the results apart. The recently released improvements to search across GOV.UK will help. The Inside Government team will also move forward on stories that will automatically inject helpful metadata. For example, we’ll include minister name into title of speeches and statements in listings and search results and are creating a sub-type of speech for statements that have multiple speakers.